As parents, natural, wholesome ingredients are on our lists for our family. Yup, you probably already know that from these easy and healthy recipes in our library! Eating well is important, but what we use on the outside should not be neglected either, especially for products that are used on our kids. After all, less is more, right? Thanks to the avalanche of readily-available information, parents may do investigative work better than the FBI (parents’ insider joke! Ha!). Truth be told, that’s what I did when the Cherub Rubs range of baby and children products were in my hands. Welcome to the family, Cherub Rubs! Newly launched in Singapore, Cherub Rubs was developed by Keeli Cambourne. As a naturopath and a mum who wanted safe, natural skincare when her second child developed severe nappy rash from an allergy reaction, she created Cherub Rubs after careful research. She takes pride in her products and ensures that all products are Australian made and owned. So I did some research about the certifications that Cherub Rubs was credited with and here’s what I found: Cherub Rubs is certified by the Safe Cosmetics Australia, which acknowledges that their formulations have been reviewed and confirmed to be either 100% or 85% free from the chemicals that form the Key Issues. This adds on to mama’s confidence and assurance before trying them out. 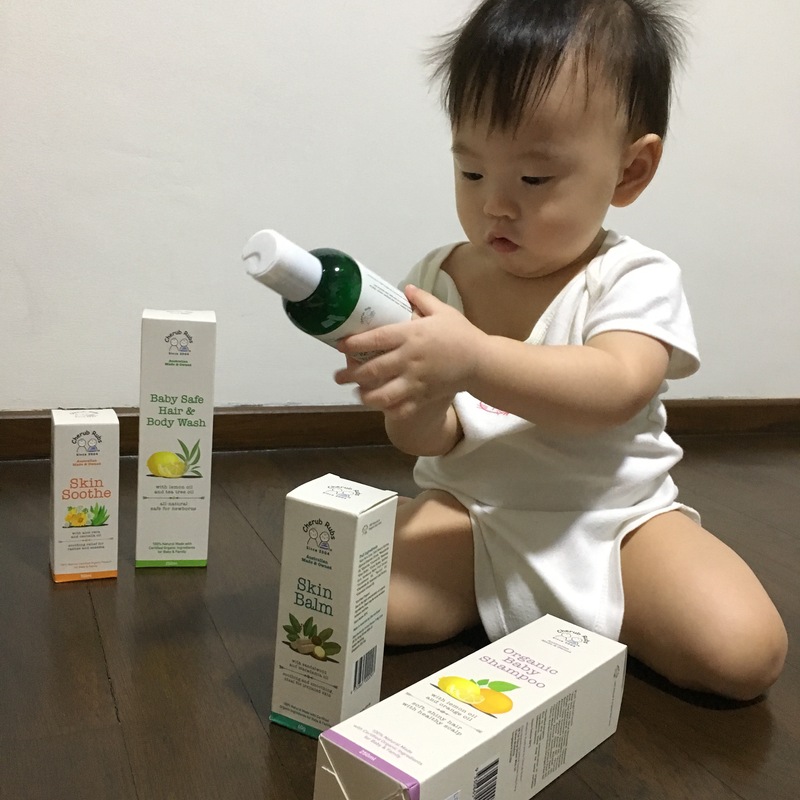 Leroy’s scrutinising the product labels of Cherub Rubs, an organic skincare range that’s suitable for newborns, young children and pregnant mums. Cherub Rubs is a 100% natural and organic skincare range that’s safe for infants, young children and even pregnant mums, and those with sensitive skin, dry, atopic skin or eczema. Sounds great for Vera already! Her itchy skin (and fingers) has battle scars, since her skin has been a cause of worry since 3 months old. Sounds like these might help with her skin – so we gave them a shot! With Vera’s current skin condition, we tried out the Cherub Rubs Skin Balm 60g, $21.40, for areas that were dry and causing itch; and Cherub Rubs Skin Soothe 100ml, $24.75, to calm mummy’s mosquito bites. Spreading the Skin Balm on dry and itchy areas, to moisturise and nourish her delicate skin. This is really important for sensitive skin, as the doctors whom we have consulted have advised. So yes, she’s been buttered up for years now! Our experience: Smells like sandalwood and macadamia oil, white cream which spreads and absorbs easily, with no visible white residue. Sandalwood Oil helps relieve itching, inflammation, and dehydrated skin, while Macadamia Oil boasts mono-saturated fatty acids (Omega 9) and Linoleic Acid (Omega 6) to moisturise skin and restore its natural barrier to reduce moisture loss. Those annoying mozzie bites kept me scratching. Tried the Cherub Rubs Skin Soothe on myself to calm the affected area. Mama puts the Skin Soothe to the test too, no thanks to mozzie bites! It started with a 5-cent sized red bump, which seemed to feel more comforted after application. Reapplied again in 3-4hours when it started to itch. Our experience: Smells like calendula and lavender, transparent gel which spreads and absorbs very easily with no sticky feel. It was cool and soothing on the affected area too. There’s Aloe Vera to soothe aggravated skin, and medical journals point that Centella Oil (also known as Gota Kola) is known to be effective in treating wounds, burns, eczema and psoriasis. Both Skin Balm and Skin Soothe are suitable for everyone including newborns and pregnant women. How about some extra love for little Leroy’s baby skin too? These products are safe for newborns and babies, so our young man enjoyed some skin-loving bath time treats. Someone’s enjoying a relaxing tub of bath time with these luxuriously pampering body wash and shampoo products from Cherub Rubs! A 2-in-1 hair and body wash like Cherub Rubs Baby Safe Hair & Body Wash 250ml, S$27.75, is a convenient option for parents who prefer to use the same product from top to toe. There really aren’t any hard and fast rules about this; more of a preference and convenient option, in my opinion. I mean… how dirty can babies get if he’s usually at home? The Baby Safe Hair & Body Wash contains a blend of essential oils rich in vitamins A, C, E, to offer gentle care during bath time. It’s also suitable for cleaning baby’s face, and lathers easily with water when using as shampoo. For bath, pour a small amount into bath tub and mix with water. To put things into perspective: active kids with a full head of hair may need extra care with a separate shampoo, as they tend to perspire more, especially if they’re engaged in outdoor activities. It’s also nice to have a dedicated shampoo to keep their scalp clean, since oil and grime can clog hair follicles. With Vera’s full head of hair since birth, we’ve pretty much been using a separate baby-friendly shampoo for her. As for Leroy, he helps us to “save some money”, but since we already have bottles of shampoo (we usually look out for children’s shampoo that’s suitable for both baby and toddler – mum’s tip there! ), both kids use the same ones. Scent-wise, I thought it smelled similar to the Cherub Rubs Organic Baby Shampoo 250ml, $27.75. Looking at their ingredient lists, the only difference? The former comprises of Tea Tree Leaf Oil, while the latter included Orange Peel Oil instead. Our experience: Both smell nice and weren’t nose-clogging. In fact, it felt like Leroy was enjoying a luxurious spa session knowing that both products contain essential oils leaving a whiff of scent in his hair too! My hands didn’t feel like they were drying out either. Both were easy to lather for hair wash, along with some bubbles without being super foamy. Rinsing off from hair and body didn’t take extra effort too. With Singapore’s climate a superior condition for mosquito breeding, the Dengue and Zika outbreak caused plenty of frenzy nationwide. Protecting our kids from mosquito bites is essential. When we’re at the beach or at the pool, mummy makes sure the kids are smeared with sunscreen. Having been in the skincare industry for several years, such knowledge certainly comes in handy now as a mother. The Centre for Disease Control & Prevent (CDC) advises that young children and pregnant mums are not encouraged to use products that contain DEET, other natural ingredients such as Oil of Eucalyptus may help protect from mosquitoes. With 3 products that help protect our kids from mosquitoes, we also appreciate the fact that there’s UV protection in Scatterscreen too! Keep the family protected from bites! Suitable for newborns, adults and pregnant mums without inhaling harmful chemicals. Multi-functional products are great for parents – so we have Scatterbugs 100ml, $25.35, Scatterscreen 100ml, $27.75 and Skin Guard Plus 100ml, $25.35 to use based on different needs. Our experience: Scatterbugs‘s clear lightweight lotion spreads easily on skin. Smells like Lemon Eucalyptus Oil and leaves no sticky residue after application. Application is recommended for an all-day protection. On the other hand, Scatterscreen is a 3-in-1 product which offers UVA and UVB protection with SPF8, and protects against bugs and dry skin! It’s great for outdoor activities especially if kids will be in the sun. Don’t forget to reapply every 2 hours. Buzz off, bugs and mozzies! Both are safe for infants and pregnant mums too. Our experience: Scatterscreen smells slightly stronger than Scatterbugs, and comes in a white lotion form. Leaves a very faint layer on skin (it’s sunscreen so it should stay on skin, not absorbed!) and it’s white due to the Zinc Oxide which offers sun protection. Both Scatterbugs and Scatterscreen are suitable for everyone including newborns and pregnant women. Protect your toddlers against bugs and mosquitoes without the use of DEET products. Our experience: At first whiff, you’d know Skin Guard Plus was developed to keep mozzies away! With a higher concentration of Lemon Eucalyptus Oil than Scatterbugs and Scatterscreen, that might be the reason why Skin Guard Plus is recommended for 3 years old & up, teenagers, adults and pregnant women. For newborns and kids below 3, Scatterbugs would be your bub’s mosquito defense team. As a mum, I appreciate the promise of 100% natural products especially when it comes to our kids. Knowing how strict Australia is when it comes to skincare and food, it gives us extra confidence that Cherub Rubs is certified toxic-free, and the products are suitable for all skin types, not just those with sensitive skin too. In addition, the OFC certification from Australia recognises that the products are fully certified organic, differentiating them from other ‘natural’ products. Mums searching for safe organic skincare for your kids, you know what to look for! Cherub Rubs products are available at selected Guardian (end Feb), Watsons (end Feb), and SaSa stores, Isetan, OG, selected baby and maternity stores, and independent pharmacies. They are also available online at Healthscoop, Redmart, and beautiful.me. Do you use organic products on your children? Tell us what your favourite brands are!